I feel like, in some ways, I was exceptionally lucky growing up. Throughout my childhood I was told I capable of accomplishing anything I had an interest in pursuing. Both of my parents are intellectual and growth orientated, my grandparents were all self-made, entirely optimistic and competent people and my teachers and mentors were all supportive and nurturing. I had such a blissful bubble of confidence surrounding me that when I began to encounter obstacles in college, it was shocking and puzzling. In three short years, I changed my major four times. Not because I’d failed at anything, in fact my lowest semester GPA was a 3.8, but because I started being told that I wasn’t suited for certain careers; I was to squeamish to be Doctor, women don’t have the hand-eye coordination for Nuclear Medicine, I was to empathetic for social work or teaching. I left college completely demoralized, settled into a part time counseling position and focused on family for a few years. Since then I haven’t really had a plan, it’s always been more of a to-do list. I’ve taken positions based more on what captured my interest and suited my needs at the time over what would further my career aspirations. About twelve years ago I took a gamble on a company that promised opportunities and room for growth and happily I can say looking back that I did make the right choice. Throughout my time here I’ve been regularly challenged to learn more, better myself and positively impact the world around me, in return I’ve been encouraged and promoted along the way. A few years ago I realized that I still didn’t have a plan and started working on what I felt were the gaps in my education or experience; flexing my leadership abilities, focusing time on learning new technical and business skills and creating a positive, efficient work environment. But I still didn’t have a plan. This year I set about to treat everything I needed to accomplish but had procrastinated on as a project with milestones, tasks and deadlines. Number one on that list was creating a career development plan. Last year I spent some time learning about business modeling after reading Business Model Generation. When I spotted Business Model You by the same author on the shelves over the holidays I immediately grabbed it, it promised to be the answer to my planning problem. Business Model You takes the exact same approach used in Business Model Generation but with a very key twist, all of the exercises involve discovering yourself, your abilities and your passions. 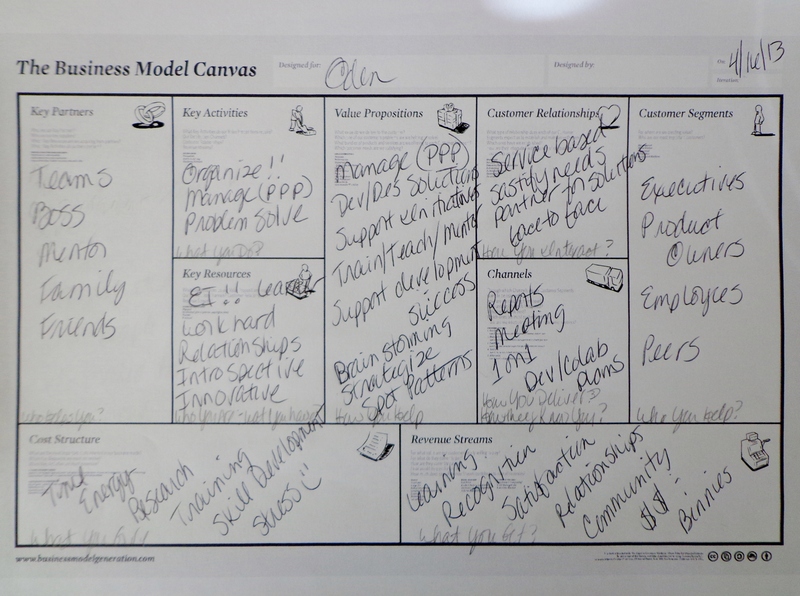 The first section of the book takes you through each piece of the model generation canvas; who you are, your skills/abilities, your partners and customers, how you communicate and the costs and rewards of doing what you do. I did my canvas around my current position; you can see the results in this photo. Getting to this level of detail took about an hour of jotting down the results of nine separate brainstorming exercises. I did all of these in a very quick, write down the first thing to pop into my head fashion. Nothing at all surprising but very interesting to see my work life surmised onto this one page. Next up I have some reflection exercises to do….